Hey everyone. Most of you know I’m up north. Southern Ontario. Love the hobby and am an avid coco- nut! I have been doing all kinds of germinating experiments. And just growing experiments. Up to date my palm room has been very dry due to. Obviously furnace is on. Second basement is cool so i have heat running 24/7. (Oil radiator ) room always kept in mid to upper 70s. 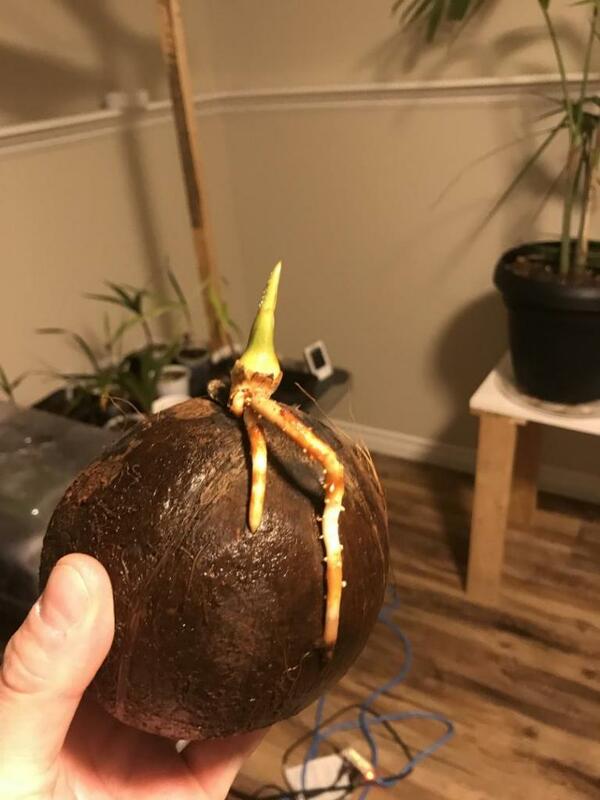 So my very first coconut. Which was a store bought germinated is now over a year old. It has had its ups and downs. It was easy the first 6 months when it was small to keep it humid and warm. During the summer it did well here. Daytime temps of 31c and humid and we get 15 hours of daylight in summer months. Leads to this winter. When a new frond opens it brown tips and degraded fast and the next spear will do same. So my next experiment was I put it on a set of horses. Metal ones which radiant heat and put my oil heater underneath to warm it from soil up. This had ups and downs as dry heat made the brown tipping worse. (Obviously) so then I put a clear plastic bag over it. This was so/so. The radiant heat coming up the pot kept the soil warm but wasn’t hot enough to heat the air up in the bag and get the humidity high enough. So this leads too today’s experiments. Same horse. Coconut high up. My warm mist humidifier which is pretty good on hydro literally right into the bag. I have a weather station inside and currently am checking on it every 30 mins to see what humidifier setting is the best so that I don’t cook my palm. There is also an led grow light shining bright on it as well. I have so much attachment to this palm as it was my first coco to germinate and it took me 3 months to do so. I will update everyone on this setup and see ihow it works. More light maybe? Outside when I measure the sun the shade is 5000 lumens. My grow lights have a hard time even matching outdoor shade. I have tried coconuts for years and never have much luck getting through the winter. This year I had one that is in my sunroom facing south and got a pretty good amount of light. It looked really good, I had not watered it much at all, only a handful of times since bringing it inside in September/October. Last week I decided to put it in the sink and give it a good watering, I soaked it really good and let it drain for a couple hours in the sink and then put it back where it was. It quickly started going downhill, turning brown and shriveling up. Today I gave a little tug on the spear and it came right out. It's about 2 foot tall, I have a fan going 24/7 and a humidifier that generally keeps it around 50% humidity, sometimes higher, sometimes lower. I thought I had a winner with this one but I guess I gave it too much to drink. I've lost coconuts indoors due to lack of humidity. I've realized from other people that the best way to create a hot and humid environment is to place your coconut in the bathroom after you've taken a hot shower. The steam replicates a tropical humid day that is needed for coconuts. I don't know about Queen palms but I've heard many palms will decline due to lack of tropical sunlight. If you put a palm outside in the North and a palm outside in south florida the sunlight is different and some palms will decline. My light tester checks outdoor shade here as about 5,000 lumens, a sunny day as 60-80,000 lumens and my grow lights in the garage as 1,000 lumens. So outdoor shade on a sunny day is stronger than my grow lights. I haven’t had issues with light or low humidity. I have mine in a south facing window (a godsend for any plant) and humidity hovers around 50%. My Coconut is actually the only tropical palm of mine that has grown consistently (albeit slowly) over the course of the winter. This is my 3rd attempt, my first 2 never made it beyond November due to root rot. I’ve since done away with peat based potting soils and now use coconut coir + perlite exclusively. And for the coconut I’m using a clay pot instead of plastic or ceramic. Both changes have made a significant difference in the overall vigor of this palm vs the first two. I’m so glad you posted this because I’m also having issues with mine. I keep mine right under a grow light and next to a heat vent, on the third floor, next to the bathroom for humidity. I also turn on the humidifier now and then and have a spray bottle for misting, but I don’t know if that and the shower humidity are enough. I also recently did a shower watering and now it just seems much less happy. ☹️ I am pretty sure it has mites and I was trying to wash them off, but I think it might have made it worse. ☹️ I’m not sure what to do with it at this point. It also needs to be transplanted to a larger pot but was advised to wait for summer for this. Okay, I'm not sure where to move it to because that's pretty much the only place in the house for it, but I can try and figure something out. I thought that being right next to the bathroom would help, since the moist air seeps out from the shower (we aren't using a fan this winter because the house needs it anyway) and that way I also remember to put it in there during/after a shower. BUT I will see what I can do. I am really worried about it; I looked at it tonight and many of its fronts are starting to close up--they are the same fronds that seem to have some sort of tan speckly "dust" (I am assuming some sort of pest) and I really don't know what to do about all of it. I think it has something living in the dirt, too, so I wanted to repot, but someone told me to wait..... I really am considering repotting asap, even if it's cold, to get it away from any pests in the dirt. No idea what's going on with the fronds, though. Does any of this sound familiar to you? I just have no idea where any pest would have come from. What do you guys think if I pot my next one in clay pebbles and perlite only no soil? Remember will be in a pot forever ? That's interesting. Where would it get its nutrients? Do you have any ideas on what I can do to save it? I only bought it maybe a month ago. No idea why they sell it in so small a pot and with unsuitable dirt........? Sounds good to me! Thanks for all the tips and help. It seemed to take quite a downturn today and totally freaked me out. I applied the dawn-oil-water homemade pest control, in case that is also a problem, and am going to just have to put a pot and cactus soil (or whatever) on the credit card, I guess. I'm not giving up this easily! I really, really hope yours takes a turn for the better soon! Do you have any ideas on what I can do to save it? Sure! Plant it in my backyard! One thing you can try is adding bottom heat with heat mats. If you can get the soil to warm up, the roots may start taking up nutrients. Since it seems to have outgrown the pot, you could put it in a larger one with sand. I'd say go find some fast-draining sand or lighten some potting mix with perlite (50/50). Bigger pot, lighter mix, bottom heat, and cut the old pot off to avoid damaging the root. Thank you! How do you feel about utilizing cactus soil for it? I heard that was good for palms but unsure if I heard that just about a certain type or not. Oh, and what sort of heating pad should I be looking for? Does it have to be on it constantly? Since you need something that drains well and warms up fast, probably a good choice. Edit: Or maybe not if @Rickybobby says it didn't work for him. Here, I use potting soil and perlite for my standard mixes. For things that like more moisture retention, typically 1:2 perlite to potting soil. For stuff that likes faster draining soils, the old 1:1 perlite to potting soil mix is my gold standard. 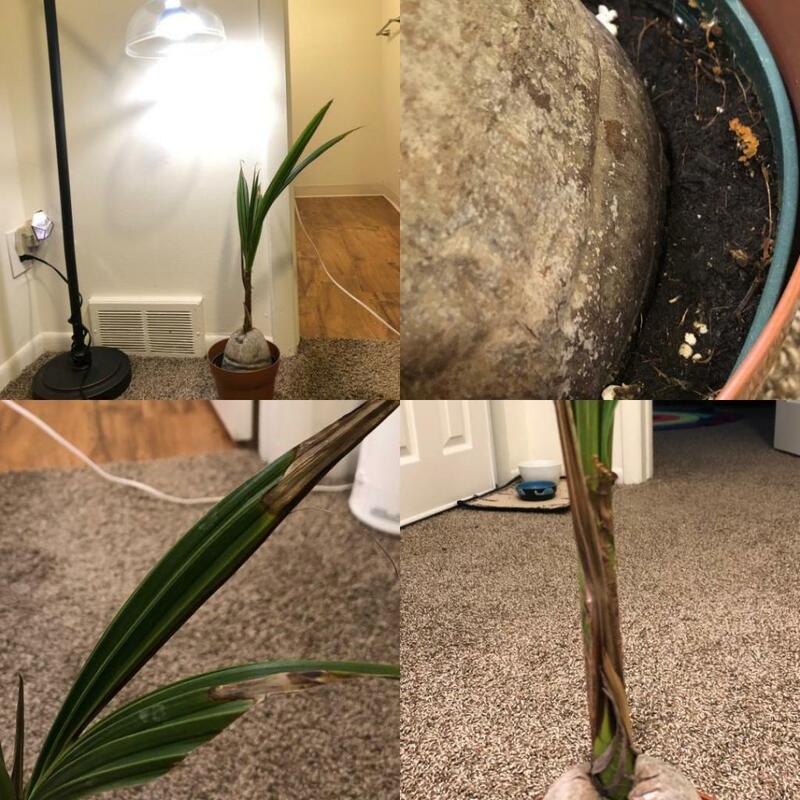 Looks like you mostly need a larger pot and some bottom heat so the palm will take in nutrients. Keep in mind that they like an annual mean temperature of at least 77F. They are finicky even down here for that reason. They sell heat mats specifically for gardening with timers and the works. Some have been known to use the ones you put on your back but I don't officially endorse that method. Since you need something that drains well and warms up fast, probably a good choice. Here, I use potting soil and perlite for my standard mixes. For things that like more moisture retention, typically 1:2 perlite to potting soil. For stuff that likes faster draining soils, the old 1:1 perlite to potting soil mix is my gold standard. 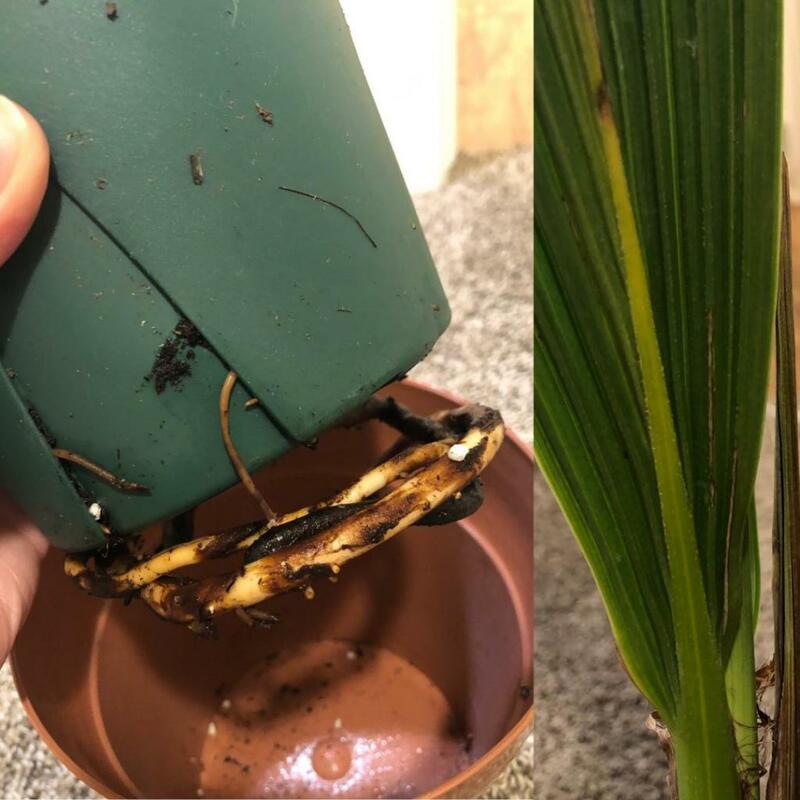 Looks like you mostly need a larger pot and some bottom heat so the palm will take in nutrients. Keep in mind that they like an annual mean temperature of at least 77F. They are finicky even down here for that reason. Thank you to both you and @Rickybobby for all of the input! I'm sorry I hijacked your post, RB........ 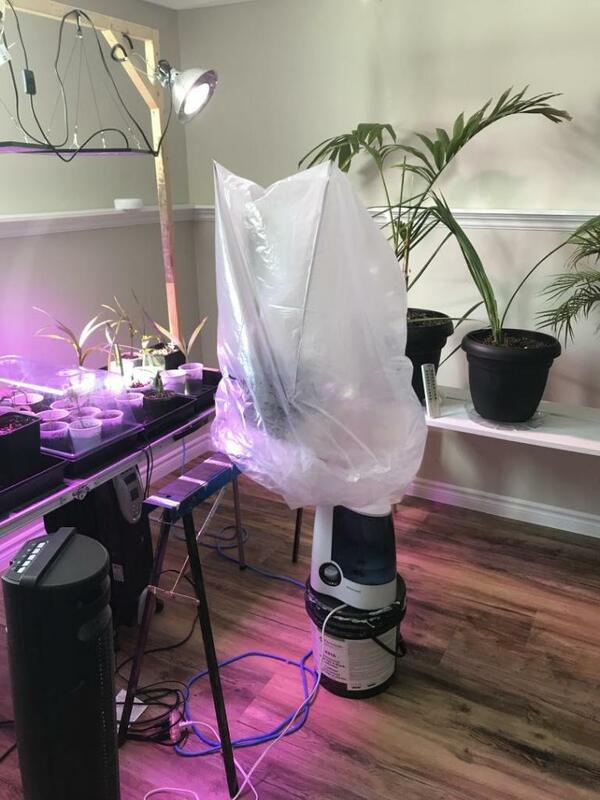 I'll deffo take some pics of the process once I get whatever soil and the pot--maybe tomorrow? 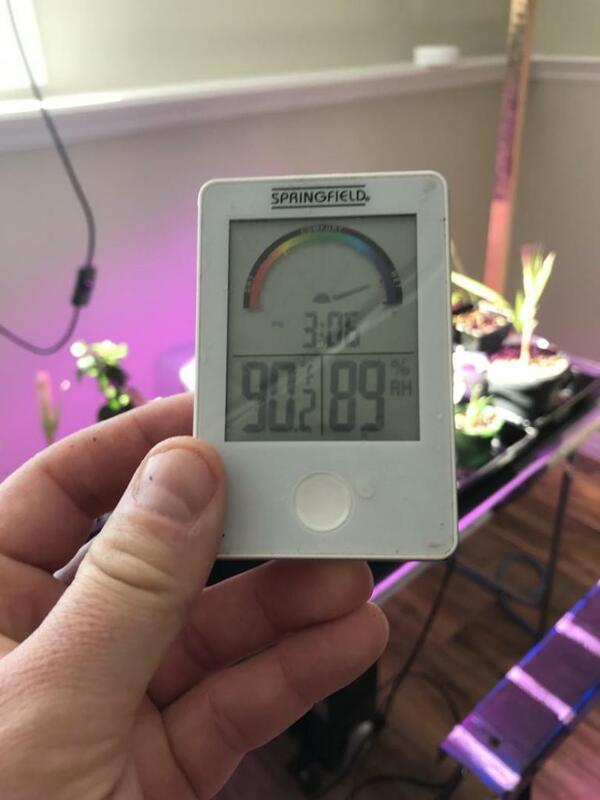 We also like it fairly warm, and that's why I keep it in the center of the third floor...... but I totally get the roots not being warm enough. We will see what happens, I guess! We all already know that a cocos is a huge gamble, anyway. This looks amazing!!!!! I'd love to learn your method. Get a 5 gallon bucket and a regular sized cup. Put one cup of perlite in the bucket, then one cup of potting soil. Mix it up real good, then repeat. When you have enough to fill the bottom 2-4 inches of the new pot, place the new pot on a sheet of plastic or a car floor mat. You may want to place a saucer or aluminum baking pan under the new pot so you don't get everything wet when you water the new soil in. Pour the mix in, cut the pot off the palm while the old pot is over the new pot, and set the palm down on the newly poured mix. After that, use the 5 gallon bucket to keep making mix to fill in around the palm. Water it in until the soil level is even with the original soil level around the palm. Presto! One last thought--has anyone tried mixing a regular soil with lava rock? Is this a terrible idea? I've added lava rock and river rock to pots to keep them steady in the wind, but they get fun to carry if you have to move them indoors and outdoors. But I mean, it'll work, right? 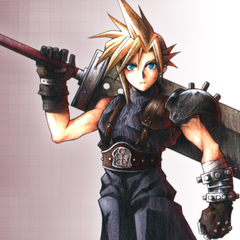 I'm thinking about mixing the theoretical cactus mix with some lava rock, as long as it's not dangerous to the roots or anything.